Top-left: Former Ivorian soccer player Emmanuel Eboué. Top-centre: South African athlete Thabang Mosiako. Top-right: Nigeria's women bobsled team. Bottom-left: Pitch invasion at the Moses Mabhida stadium. Bottom-centre: Zimbabwean striker Khama Billiat. Bottom-right: Liberian President George Weah. 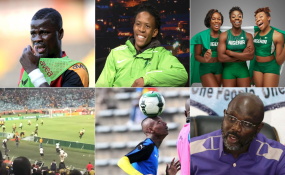 Cape Town — With the whistle about to blow for 2018, it's time to take a look back at the top sports stories of the year. Soccer dominated this year's headlines. Whether drama from their personal lives or that of major tournaments like the World Cup and Afcon, there was definitely no shortage of attention for players of the beautiful game. Fans also made the headlines when their dedication to the sport went too far. As for athletics, it may not have gotten the same level of attention this year but the headlines that made it to the top showed the impact of racism and social media on athletes' lives. From tragedy to triumph, here are our most-read sports stories of 2018. 1. Since he hit rock-bottom and admitted he had contemplated suicide due to his financial problems, Emmanuel Eboue was inundated by football fans wishing him well before he was offered a job coaching the under-14 team at his former club Galatasaray. 2. South Africa's 5000 metre record holder Thabang Mosiako was beaten by a group of men after he defended a cashier who was allegedly sworn at. Despite his injuries, Mosiako swore that he would travel to Algeria and compete at the African Champs. 3. With the Russian World Cup beckoning, Jide Alaka of the Premium Times reckoned the Super Eagles could channel the spirit of 'Wakanda', the fictional African country introduced in Black Panther, by implementing five lessons from the blockbuster Marvel Studios film. 4. South African Minister of Sport and Recreation Tokozile Xasa condemned the violence that erupted at Moses Mabhida Stadium in Durban following a Nedbank Cup semi-final tie - angry fans invaded the pitch after Kaizer Chiefs' 2-0 loss to Free State Stars. 5. Zimbabwean international striker Khama Billiat bid farewell to South African club Mamelodi Sundowns after negotiations for an extension of his contract broke down. 6. Football fans trolled Francis Odinaka Uzoho on social media as being the 'oldest' 19-year-old at the World Cup in Russia. 7. France's first place triumph at the World Cup raised the question of whether Africa was the ultimate winner of the tournament with Les Bleus made up of a team that was almost entirely of African descent. 8. Three-time World 1,500m and Olympic champion Asbel Kiprop cried foul after a video of him kissing and caressing an unidentified woman in his car went viral. He accused the woman of destroying his family and career. 9. Former FIFA footballer of the year and President of Liberia George Weah made a surprise return to soccer after he played for 79 minutes in a 2-1 friendly loss to the Super Eagles of Nigeria. 10. Four key Zimbabwean senior team memebers - Willard Katsande, Cuthbert Malajila, Nyasha Mushekwi and Mathew Rusike - were cut from the lineup for the 2019 AFCON qualifier against Liberia after they led a protest against non-payment of bonuses earlier this year. 11. The top 20 African teams in Fifa's October rankings saw Ivory Coast holding on to first place while Ghana, Algeria, Nigeria and Mali rounded out the rest of the top 5.